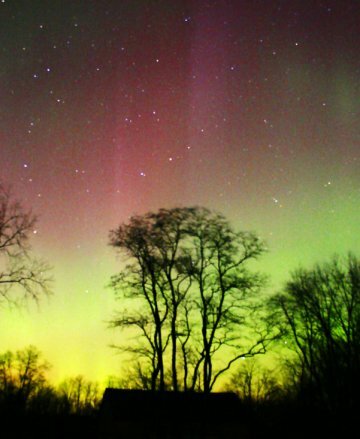 SUBSIDING STORM: A geomagetic storm that sparked Northern Lights as far south as Arizona last night is subsiding. The cause of the storm: a coronal mass ejection (CME) hit Earth on Dec. 14th. Our planet's magnetic field reverberated for more than 24 hours after the impact. Another CME is on the way, but it won't cause such a widespread display. The incoming cloud was launched yesterday by an X1-explosion above sunspot 930. The blast was not squarely Earth-directed, so the CME's impact will be a glancing one. Nevertheless, sky watchers should remain alert for auroras when the CME arrives on Dec. 16th. Above: Auroras over Kalamazoo, Michigan, on Dec. 14th. "We're so lucky!" says photographer Richard Bell. "First, we get to observe the Geminid meteor shower on Wednesday then we get more Geminids and a nice aurora display on Thursday." SOLAR RADIO BURSTS: The latest X-flare from sunspot 930 (an X1.5 explosion at 22:15 UT on Dec. 14th) sent shock waves billowing through the sun's atmosphere. Those waves produced a cacophany of shortwave radio emissions. Thomas Ashcraft recorded some of them using his radio telescope in New Mexico: listen. Above: A spectrogram of solar radio bursts on Dec. 14th. Courtesy: NASA's Radio Jove Program and the University of Florida Radio Observatory (UFRO). "We were lucky to catch a slice of these powerful solar radio sweeps at 22 MHz while the Sun was still in our antenna beams," says Ashcraft.